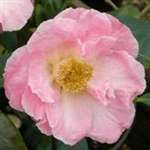 Large to very large, semi-double flowers, with white petals shaded pink towards the edge. Fairly vigorous, upright, open growth habit. Flowers February to March. A cross between C.reticulata and 'Donation' (raised by Os Blumhardt in New Zealand, 1982) and the reticulata parentage can clearly be seen in the large flowers and leaves, stiff stems and open habit. Large to very large semi-double flower. White shaded pink towards edge. Upright, open growth habit. Mid season flowering.